Take a deep dive into the neighborhood high schools at an event set for Tuesday night. LAKEVIEW — Anxiety is running high across the city as eighth-graders learn whether or not they have been accepted into one of Chicago's selective-enrollment high schools. "It's insane," 47th Ward Ald. Ameya Pawar said of the pressure on middle-schoolers. "To try to build one's life around a test score of 99.8 or 99.7? That's not what an education is supposed to be about," he said. On Tuesday, families on the North Side will have a chance to take a closer look at Amundsen and Lake View high schools, both of which have made a concerted effort in recent years to become a viable choice for students of all abilities. Elementary school students and their parents are invited to the 6 p.m. event at Hawthorne Scholastic Academy, 3319 N. Clifton Ave. An arrangement has been made so that students at any of the feeder schools within Amundsen's and Lake View's boundaries can attend either of the two high schools. Anna Pavichevich and Paul Karafiol, principals of Amundsen and Lake View respectively, will be available to provide information and answer questions about their schools' academic programs, athletics and clubs. Students from both schools also be will be there to share their experiences. The evening is being hosted by Grow Community, a nonprofit organization that supports a continuous neighborhood school system — kindergarten-through-high school — on the North Side. "There are 17 elementary schools that feed into Grow Community. The event on the 7th is about bringing all of those people together and making this a larger community movement," said Hawthorne Principal Nate Pietrini. "As a principal, I am normally just thinking about the high school placement of my own students, and that ends up supporting the spread of students throughout the city, instead of supporting the idea of community," he said. "It's not easy being a part of a big urban school district, so if we are going to make it work for K-12 in the neighborhood, we have to all come together," Pietrini said. The event also provides an opportunity for the high schools' administrators to address concerns parents have about their programs and to build confidence in their ability to provide a rigorous education to high-achieving students, Pavichevich said. "We are still experiencing a reluctance from many in our community to commit to sending their children to the neighborhood high school," she said. "We are trying to learn about what barriers remain for us to overcome when parents are deciding where to send their students for high schools," she said. "What do our families need in order to be secure in the knowledge that their neighborhood high school is the best fit for their children?" Bringing grade-schoolers and their parents face to face with the high schools' students and leaders is Grow's attempt to build bridges between the two. "It's our hope that students and parents leave this event with lots of rich information about both high schools, as well as insights — particularly from the student perspective — that go beyond what you can find on a website," said Sarah Makela, executive director of Grow Community. Along with touting the accomplishments of Amundsen and Lake View, Tuesday's event aims to dispel the notion that not being accepted into a selective-enrollment high school is somehow a failure, said Pawar. "Life isn't over," he said. 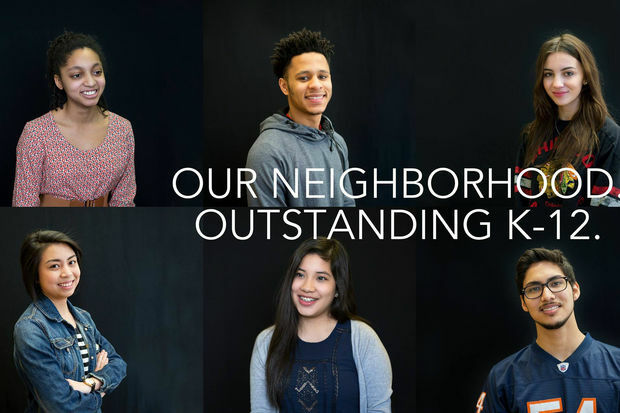 "There are other options that are our really wonderful neighborhood schools."